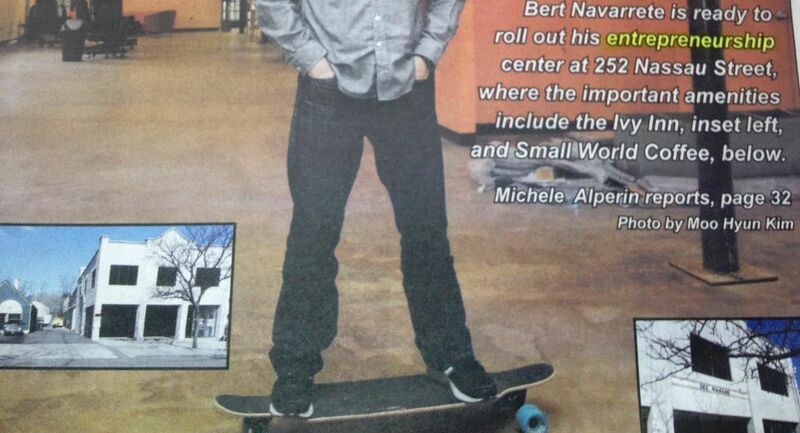 I was delighted to see Burt Navarrete pictured on a skateboard on the cover of the March 6 edition of U.S. 1 at his newly launched Tigerlabs entrepreneurship center. As someone who both skateboards and started a business as a teenager, this image — and the inclusion of words like “Innovation” and “High Energy” with it — were particularly appealing to me. 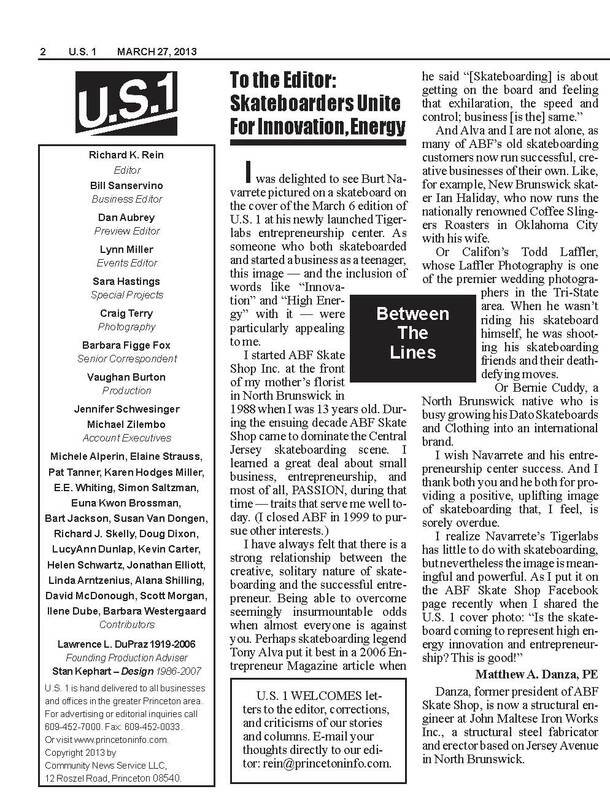 And Alva and I are not alone, as many of ABF’s old skateboarding customers now run successful, creative businesses of their own. Like, for example, New Brunswick skater Ian Haliday, who now runs the nationally renowned Coffee Slingers Roasters in Oklahoma City with his girlfriend. himself, he was shooting his skateboarding friends and their death defying moves. 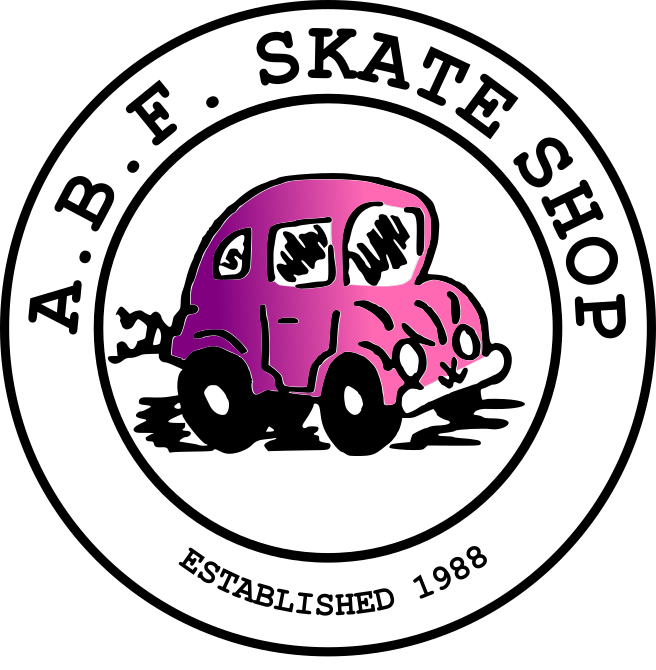 Or Bernie Cuddy, a North Brunswick native who is busy growing his Dato Skateboards and Clothing into an international brand. Danza, former president of ABF Skate Shop, is now a structural engineer at John Maltese Iron Works Inc., a structural steel fabricator and erector based on Jersey Avenue in North Brunswick.